Sgt. Frank Johnson (Kristoff) isn’t simply Sgt. Frank Johnson, Vietnam War soldier. Oh no, he’s so much more than that. You see, he had ninja training as a child. In spite of, or, perhaps, because of his proficiency in the deadly arts, Johnson is “marked for termination” by his military higher-ups. While war buddy Jim Anderson (Gaines) and computer technician Nancy (Mansfield) do their best to help Johnson with his plight and troubled ways, Johnson is kidnapped and, of course, tortured by a league of eyepatchioed/non-eyepatchioed baddies. Naturally, this makes him mad and after submitting to the torture for a surprising amount of time, his ninja training finally kicks in and he goes on a revenge mission. To sum up, we should probably just quote the great YouTube uploader Atomic Cyborg’s description of the film: “Rambo-Ninja Rom Kristoff Takes Revenge!” That pretty much sums it up, really. Director Teddy Page and producer K.Y. Lim strike again with Blackfire, a sort of mashing-together of two 80’s action staples, the Ninja Boom and the Rambo knockoff. The results are reasonably successful, but not quite as awesome as the potential is there to fulfill. Romano “Rom” Kristoff (or Ron Kristoff as he’s billed here) is the Stallone/Dudikoff/Sho Kosugi-style hero, to the point where we inevitably called him “Rombo”. One of the characters even makes the obligatory Rambo reference, putting the whole outing into a context the viewer already has. The movie gets off to a bang - literally - much like Page’s Fireback (1983), Blood Debts (1985) and especially Phantom Soldiers (1987) - you gotta hand it to the guy, he really knows how to start a movie. 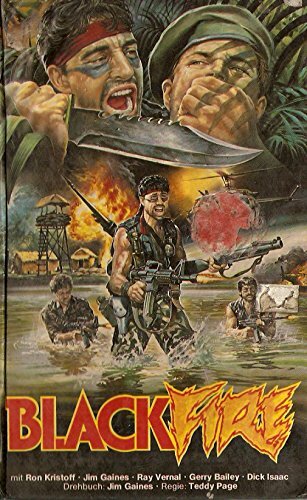 Men in army fatigues screaming while shooting machine guns, huts exploding, guard tower falls, grenade throws, neck snaps and strategic use of slo-mo, all among the leafy green foliage kick off the movie and we were impressed, no matter how many times we may have seen these things before. But the icing on the machete was Rom’s “super crossbow” - a badass crossbow with some sort of missile as the projectile. Inevitably, though, things slowed down after this impressive opening. As much as we love 80’s computers with their green one-color text, watching the Nancy character work on one for such a long time dragged the movie down. Then we have the time-honored barfight, and then the (overly-extended) Prerequisite Torture. All the “bullet” points are thus hit. There’s even a WYC (White Yelling Chief), and Rom has a classic black “revenge outfit” that he dons before the aforementioned final mission. It all adds up to some standard namsplotation but with a healthy handful of standout moments. It’s like diluting your Metamucil in water. There should have been less water. However, there is a lot of comical dubbing, including very funny dubbed grunting and yelling. But these are men of action and not words - or at least, that’s what Sgt. Jim (Gaines, who co-wrote the movie) tries to turn the soldiers into, but as drill sergeant, he has his work cut out for him, with a cadre of pudgy recruits who look like they spend more time cultivating their mustaches than their muscles. Much like how Sgt. Blackfire Johnson (that’s his code name, by the by), listens to a regional variant on Cyndi Lauper’s “She-bop” when he wants to collect his thoughts and ponder his situation, and then does a triumphant snapping of his fingers when he comes to a realization, the viewer will also have a realization - that this jungle outing could’ve been better. That’s not to say it doesn’t have its moments, especially the beginning, but it’s easy to see why this never had a U.S. VHS or DVD release. Sure, we would have appreciated it, but video labels might have deemed it unnecessary. Thank goodness for YouTube, where, as of the time of this writing, you can view the movie and decide for yourself. And now a question: on our blog i have a new theme called "Action, die ich heutzutage vermisse" (Action i miss today). I do it with the old trailers for the movies. May i use some of your reviews with a link at the Area? A big fat THANKS to you. OH. MY. GOD. A movie about an American ninja who happens to be a Vietnam veteran? Essentially, G.I. Joe's Snake Eyes come to life? I watched the trailer on YouTube, and based on that alone, I'd agree with your assessment that this could have been so much more. While the Rambo influence was beyond evident (the montage of the "war clothes doffing" was a nice homage, if not a complete rip-off), it really could have used a lot more ninja-ing. I do have one question, though: How did you view it? Did you just watch the whole thing on YouTube? Love Teddy Page flicks, this is a goody. I have the Japanese VHS and the South African DVD. Joe: Thanks! If only it has a little more ninja-action, this could've been a classic. We did watch the whole movie on Youtube. Explosive Action: That's really cool you have both. The Japanese always get the best movies back in the 80s and 90s.